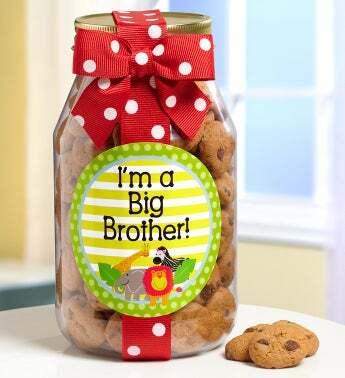 Celebrate a boy’s new family status by giving him the I’m a Big Brother! Chocolate Chip Cookie Jar. He’s sure to enjoy every bite of these mouthwatering mini-chocolate chip cookies packed in a resealable quart jar tied with a bright red ribbon covered in white polka-dots.